On Wednesday, the US Federal Open Market Committee met for their monthly meeting. Interest rates remained unchanged at 0.5% to 0.75%, in line with market expectations. The meeting, headed by Janet Yellen, Chair of the US Federal Reserve (Fed) was the first since Donald Trump was sworn into office. The Fed signalled that interest rates remain on track to be increased in the forthcoming year as policymakers noted an improvement in business and consumer confidence in the wake of the election of Donald Trump. Last week the Dow Jones Industrial Average closed above 20,000 points for the first time signalling an improvement in investor sentiment. 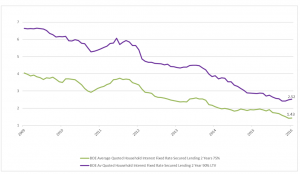 What does an increase in the federal funds rate actually mean for investors? Historically, a rise in the US interest rate signifies that the economy is robust and is in a position of strength. However, bond investors will face a significant headwind and the quantum of change rather than the directional change will be an important consideration. Currently the market is anticipating two, possibly three, rate hikes in 2017. If more rate rises were to occur, perceptions would shift to a more challenging outlook. Right now economic data from the US continues to present positive signals. Unemployment is at 4.7% which is the lowest it has been since 2008, and in December inflation rose for the fifth consecutive month to 2.1% from 1.7% in November, coming closer to the 2% target. As well as this, consumer spending continues to rise. Similarly, this week the Bank of England kept interest rates on hold. Rates are at 0.25%. What’s interesting is that the Bank raised its growth forecast for 2017, now expecting the economy to grow 2% in 2017, up from a November forecast of 1.4%. Carney stated, “the Brexit journey is really just beginning. While the direction of travel is clear, there will be twists and turns along the way. Whatever happens, monetary policy will be set to return inflation sustainably to target while supporting the necessary adjustments in the economy,”. European Politics, an Opportunity or a Threat? While these key elections are not expected to see the rise to power of major right-wing parties, they are likely to impact traditional and established political groups, thus ushering in a heightened risk of instability. However, if we step away from the geopolitical maelstrom how is the European economy in aggregate actually performing right now? Europe’s Economic Sentiment Indicator, which aggregates business and consumer confidence showed it reached its highest level since March 2011. Gross Domestic Product (GDP), a key indicator of economic growth, grew 0.5% in the final quarter of 2016. Inflation has been pushed up to 1.8% in January up from 1.1% in December and marginally below the European Central Bank’s (ECB) target of 2%. While inflation may hit living standards, the consequences depend on whether or not wages go up in tandem. Core Inflation, which strips out energy and food prices, remains subdued at 0.9%. Interest rates are on the floor at 0.0%, leaving cash savers in Europe facing the unfortunate reality of confronting rising inflation and thus earning negative real returns. However, it benefits those looking to borrow or take out a mortgage. Unemployment continued its downward trend to 9.6% from 9.7% in the previous month. The myriad of economic data released shows that the Eurozone recovery is gaining traction on the back of ECB’s extensive monetary stimulus. Tapering of monetary stimulus (recently announced) should remain on hold until Mario Draghi, president of the ECB, sees a sustained pick-up in core inflation. However, there will be a growing debate whether this should come earlier given the strengthening economy. For now, the data suggests that businesses and consumers are brushing off the political uncertainties that the Eurozone is currently facing, which should present investors with some interesting opportunities. Data released this week by the Bank of England disclosed that house purchases in Britain continued to advance with mortgage approvals increasing 0.7% to 68,000 in December. 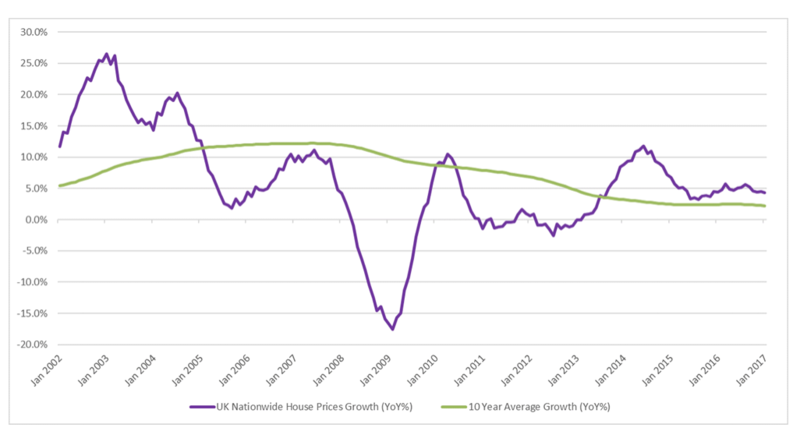 Nationwide’s House Price report (see Chart 1), also released this week, showed that real estate inflation slowed to 0.2% for January, yet continues to show resilience despite future uncertainty around Brexit. 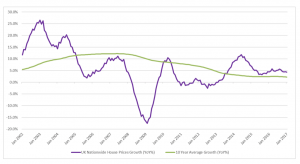 The annualised growth rate of 4.3% is marginally lower than a year ago, however it is still trending higher than the 10-year average growth rate. Looking ahead, unemployment is forecast to rise marginally above its current rate of 4.9% and real incomes (after taking account of rising inflation) are under downward pressure. 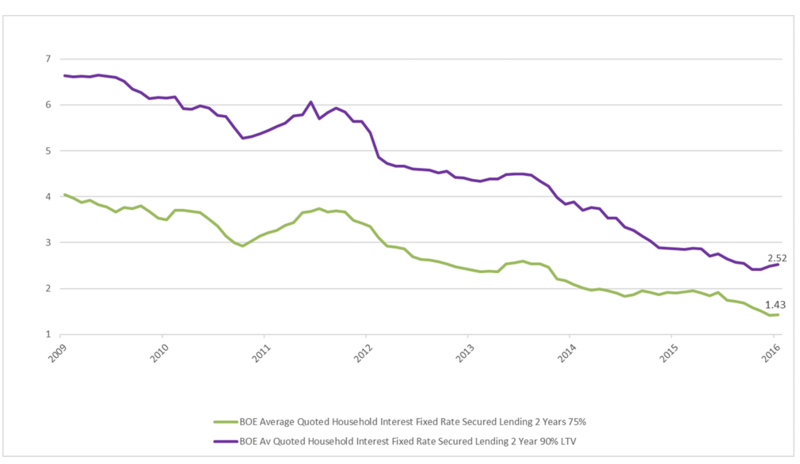 This means the main prop to the housing market is the all-time low costs of borrowing (Chart 2) and the fact that loans to value (LTV’s) of 75% and 90% have been falling in price. As pointed out in the earlier part of our note, the BoE have just raised their forecast for economic growth and are primed to act against inflation by raising rates if, as some believe, inflation becomes stickier. Inflation and the need to raise rates to ward it off is a latent threat to rising house prices which would be compounded if supply side economics in the housing market improve.